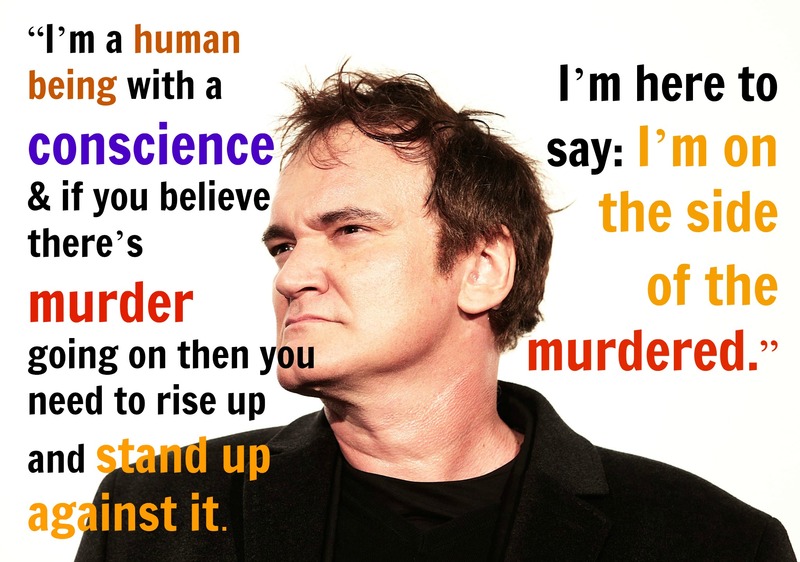 After we reported that Quentin Tarantino was threatened by police for some comments he made at “Rise Up October,” we wanted to know more about the movement. Jim Pasco, the executive director of the Fraternal Order of Police, was quick to twist Tarantino’s words, stating Tarantino called all cops murderers. 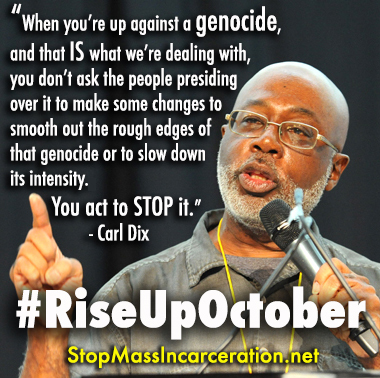 We were able to get in touch with Carl Dix, the co-initiator (with Cornel West) of the Stop Mass Incarceration Network and co-founder of the "Rise Up October” protest, to get the full story on this movement and more. If you're unfamiliar with Carl Dix, he's been involved in many protest movements, beginning in the 1960s, when he spent two years in military prison for refusing to fight in the Vietnam War. He's also a representative of the Revolutionary Communist Party (RCP), USA. 1) What led you to start #RiseUpOctober? Why New York? Were any other cities considered? Dr. Cornel West and I issued the call for #RiseUpOctober – Stop Police Terror! Which Side Are You On? because we've seen Black and Latino people walking down the street or driving to work or standing in front of a hotel or even in their home, killed by police for no reason whatsoever. Video after video of people with their hands up, people running away, people surrendering, people pulled over for a traffic stop, or doing absolutely nothing but minding their own business—verbally abused, body-slammed, tased, gang-stomped and/or outright murdered, often after they have surrendered. Eric Garner, 7-year-old Aiyana Stanley-Jones, 12-year-old Tamir Rice, Natasha McKenna, Sandra Bland and the list goes on and on. #RiseUpOctober aimed to draw a line sharply in society - Which Side Are You On? The side of acting to STOP these horrors, or the side that says it's OK for them to continue happening. There is no middle ground. We were out to change the way millions of people look at these murders and show the world that a determined and growing force of people is determined to stop them. New York was chosen because it is a center of world attention and what happens here can reverberate across the country and the world. 2) Can you explain if/how #RiseUpOctober was different in comparison to the other protests you’ve been involved with around the country recently? In the face of the authorities working to suppress the protest movement that spread across the country after the police murder of Michael Brown last year in Ferguson, Missouri with mass arrests, and as some in that protest movement get drawn to approaches that rely on one section or another of the authorities to reduce the intensity of these horrors, #RiseUpOctober was all about getting back out into the streets and taking the resistance movement to a higher level. brought together an incredible mix of over 100 family members of people killed by the police; prominent voices like Cornel West, Carl Dix, Quentin Tarantino, Eve Ensler, Kwame Anthony Appiah, Gina Belafonte, Jamal Joseph and others; students from over 20 college campuses; people from the ghettos and barrios who are the target of police brutality and murder; people of faith; revolutionaries; activists and others. 3) What impact has this protest and others you’ve been involved with had on the American people and minority communities? #RiseUpOctober gathered a force of people determined to act to STOP police terror, mass incarceration and the whole slow genocide targeting Black and Latino people. In the build up, it delivered a challenge to thousands upon thousands of people – Which Side Are You On? This force included the one hundred family members who carried pictures of their murdered loved ones and the thousands who marched and declared that murder by police must STOP. It included students who refused to stand by while murder by police gets inflicted.It included revolutionaries bringing out WHY all this was happening and that it, and all the other horrors this system brings down on humanity, could be ended thru revolution, and that the leadership for this revolution exists in Bob Avakian, the leader of the Revolutionary Communist Party. In the wake of #RiseUpOctober, the Mafia-style threats against Quentin Tarantino from police representatives across the country, and attacks on the protest for daring to call out the way police get away with murder have spread this impact to millions nationwide and around the world. The threats against Tarantino have brought forward support for him from Joyce Carol Oates, Jamie Foxx, Michael Moore, Bill Maher and others. People who are the targets of police murder and brutality have begun to see, unlike they are constantly told, that they are not alone and have people from very different sections of society standing with them to stop police terror. 4) Have you met with any 2016 presidential hopefuls about your cause? Have any been receptive? Have any declined to speak with you? We have not tried to meet with any presidential hopefuls. This election amounts to auditioning to be head of the empire enforcing these horrors on humanity, not doing anything to end them. 5) Do you think voting will change anything significant with regards to police brutality? Have you met any local leaders who have promised change? No, it will not change anything significant with regards to police brutality, or anything else. The authorities at every level have known about police murdering people for years and have worked to keep that in effect, justifying the murder and brutality the police carry out and exonerating killer cops whenever their murderous deeds get dragged into the light of day. Murder by police and mass incarceration only became a national issue because people, beginning with the defiant youth of Ferguson -- the kind of youth Obama calls thugs -- stood up and said this must STOP! If the job of the police was not to inflict terror on Black and Latino communities, why are they never punished for doing it? 6) What do you make of the Oath Keepers who went to Ferguson to stand between police and protesters? Did you have any interaction with them? 7) Have you heard anything from Pat Lynch - the president of New York City's Patrolmen's Benevolent Association (PBA) - after challenging him to a debate? He has not replied to my challenge to debate. 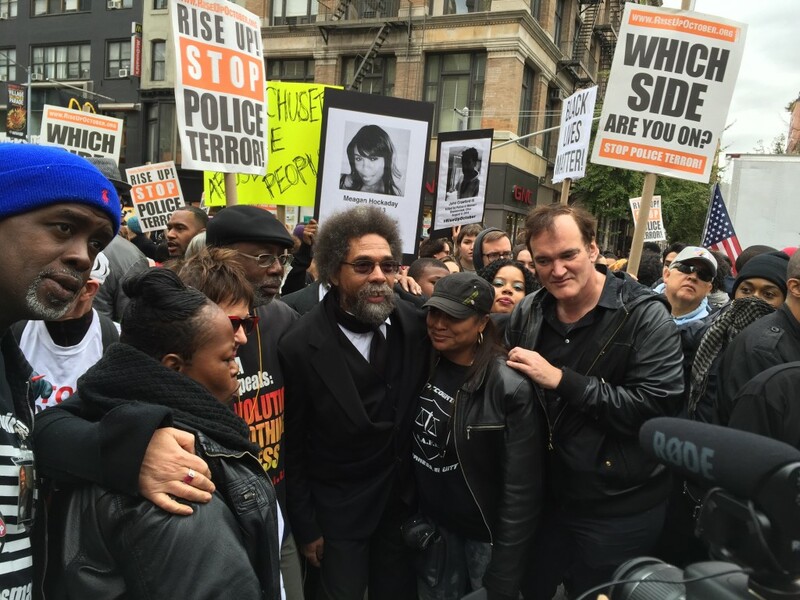 8) How did Quentin Tarantino become involved in #RiseUpOctober? Does Quentin plan on working with you further in some capacity? As he said in a television interview, we contacted him because we thought comments he had made indicated he'd be open to getting involved. We contacted a lot of prominent people, and Tarantino was one of the few who responded. We want to continue working with everyone who was involved in #RiseUpOctober, and with everyone who sees, or can be won to see, this horror for what it is and is willing to act to stop it. 9) Now that it’s November, do you have any plans to continue #RiseUpOctober? Do you think in general protests will die down during the holiday season? Either way, what’s next for Carl Dix? Everybody must support the actions of the students at the University of Missouri who have stood up and said NO MORE to the unrelenting string of racist outrages they have been forced to endure on their campus. And their example has inspired dozens of other campuses to rise in struggle against such abuses. We have big plans for the immediate future. 1.) We are calling people out into the streets on November 22, the one year anniversary of the police murder of 12-year-old Tamir Rice in Cleveland -- #WeAreAllTamirRice. The District Attorney is greasing the skids to let the cops that shot Tamir less than 2 seconds after coming onto the scene. Everyone must be in the streets demanding these killer cops get indicted, convicted and sent to jail. Cornel West and I have issued a new statement – “To All Who Are Struggling Against Racist Outrages & White Supremacy” – calling on students and faculty to be part of these November 22 actions demanding Justice for Tamir Rice. 2.) December 3, one year since the exoneration of the police that choked Eric Garner to death, we are calling for nationwide protests on that day too. 3.) And we are planning a Stolen Lives Tour in February, Black History Month, that will take family members of people killed by police and organizers to college campuses and communities nationwide to open the eyes of many more people to these horrors and challenge them to join in acting to stop it. As I said from the stage at #RiseUpOctober, this was the beginning of something, not the end; the beginning of acting to forge a movement of ultimately millions capable of jolting all society because that's what's need to halt the genocide of mass incarceration and police murder. There is a place for everyone in this. Their ideas, support, and efforts are urgently needed. In fact, this can only happen on the scale that is absolutely necessary if many, many people throw in on this, now—people who have been fighting this, as well as people who are just now coming to the fight, and those who will have their eyes opened to these horrors; Everyone is needed. We face a decisive moment, a crossroads, where terms are being set as to what is legitimate, what will be tolerated and what will be opposed. Lives are at stake. Everyone needs to be part of determining the outcome. 10) If people are interested in getting involved with protests like #RiseUpOctober, how do they find out about them? Is it primarily word of mouth or are there certain social media groups people can join/follow? Carl Dix is one of the most courageous freedom fighters of the 1960s who continues to break new ground on the front lines today in the struggle for revolution. As a young man, Dix spent two years in military prison for refusing to fight in the unjust Vietnam War. He emerged unrepentant and went on to become a founding member of the Revolutionary Communist Party (RCP), USA, dedicating his life to the emancipation of all humanity. Grounded in the pathbreaking and visionary new synthesis of communism developed by RCP Chairman, Bob Avakian, Dix’s understanding that capitalism-imperialism is not necessary or permanent has fueled his courage in repeatedly going against the tide and leading masses to fight for liberation. Twenty years ago, long before media and movements erupted against police terror and mass incarceration, Dix initiated the October 22 Coalition to STOP Police Brutality, Repression and the Criminalization of a Generation. He spent months in New Orleans after Hurricane Katrina, traveled to Sanford after Trayvon Martin was murdered, and spent time in the streets and in jail in Ferguson with the defiant ones who rose up after the murder of Michael Brown. He spoke out early against the idea that Obama would be a “savior” for Black people or anyone else, touring the country with Cornel West and addressing thousands of students and others. With Cornel West, in 2011 he initiated the Stop Mass Incarceration Network, and this year #RiseUpOctober 2015 which brought 100 families of police murder victims and thousands of others into the streets of New York City to challenge people throughout society: Which Side Are You On? Through this all, he has consistently fought to lift people’s sights to – and lead these struggles in the service of hastening – the revolution that is needed for real and lasting liberation. Who Are the Oath Keepers and What Were They Doing In Ferguson?